Ideum, in conjunction with JCB by Jean-Charles Boisset, introduces a revolutionary new way to experience the exclusive wines within the JCB Collection of fine wines. Together we wanted to create an experience that has never been seen before in the world of wine. Corrales, New Mexico & Yountville, California – Ideum, in conjunction with JCB by Jean-Charles Boisset, introduces a revolutionary new way to experience the exclusive wines within the JCB Collection of fine wines. Using state-of-the-art multitouch tables that can digitally identify the placement of a wine glass on the table surface, visitors to the newly unveiled JCB Tasting Salon in Yountville, California are guided through a first-of-its kind interactive wine tasting. This unique tasting takes a group of four wine enthusiasts through a selection of five different wines specifically chosen for the experience. As each new wine is introduced to the digital touch table, the visitors view a cinematic presentation that introduces each new wine within the flight. As visitors continue to taste each wine they can also access personalized tasting notes and additional information about each wine. The interactive experience takes between forty minutes to an hour to complete. A video demonstrating the new one-of-a-kind JCB tasting experience can be found here. 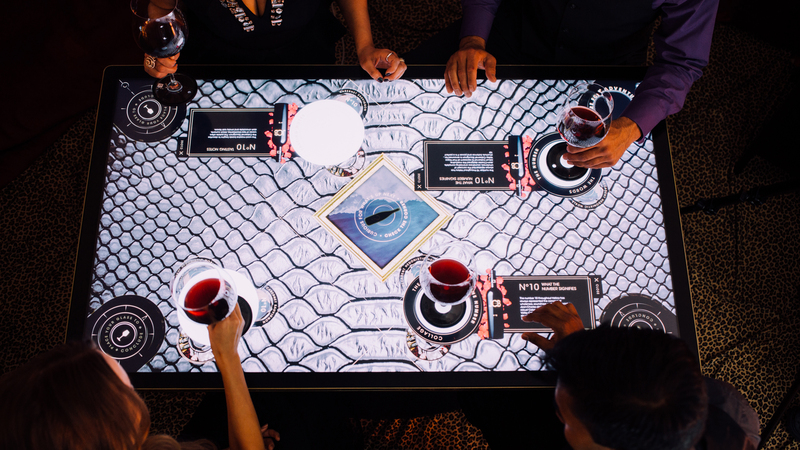 The interactive application developed for the touch table at the JCB Tasting Salon by Ideum uses 3D printed “coasters” that have capacitive qualities which act as fiducial markers that allow the software to identify each individual wine. Ideum partnered with Graphene 3D for the materials that were used to produce the tangible markers. The software system works on a modified Ideum 55” 4K UHD Platform Touch Table that uses 3M touch technology. Ideum is one of the only companies who produce 4K systems that use the advanced 3M touch technology. The table was customized by Ideum to reflect the vibrancy and opulence of the JCB Tasting Salon. The one-of-a-kind custom touch table has a gold top and a distinctive base clad in black crocodile skin. High-resolution photos for publication are available here. Created by Jean-Charles Boisset, JCB is a collection of rare numbered wines that unite centuries of Burgundian family tradition with the graceful exploration of sophisticated terroir. Dedicated to capturing style within a bottle, JCB wines embody an uncompromising personality that transcends the traditional confines of wine and is audacious, unique and mysterious. The JCB Collection of wines is now available at exclusive JCB location in Yountville, St. Helena, the Russian River Valley and the Ritz-Carlton, San Francisco. For more information, please visit http://www.jcbcollection.com or contact Tamara Stanfill at (707) 963-6939 or tamara.stanfill@boisset.com. Graphene US is in the business of developing, manufacturing, and marketing proprietary polymer nanocomposite graphene-based materials for various types of 3D printing, including fused filament fabrication as well as the design, manufacture and marketing of three-dimensional printers and products for worldwide customers, including in the aerospace and automotive industries, manufacturers of medical prosthetics and the military. Graphene 3D currently has four US patent applications pending for its technology. For more information, please visit http://www.graphene3dlab.com or contact Kristie Galvani at (212) 843-9205 or KGalvani@rubensteinpr.com. Different Wines, Different Textures.Ideum has collaborated with JCB to create an entirely new wine tasting experience.